Quite often when we visit a stone circle we are taken aback by the sheer scale of the standing stones. Invariably, I have found that we do not look more closely at the detail on the stones themselves and the markings on the ground around stone circles. This is precisely where my focus has been placed and it is this that has driven my research in recent years. Through visiting and photographing many stones I have noticed a constant similarity both in the shape of the stone and the markings that are found embedded within them. These markings support my belief that these are forms of ancient animal traps. 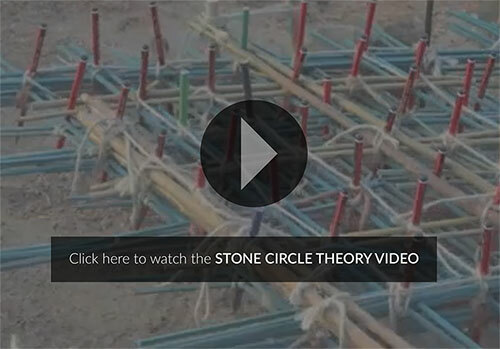 The central mechanism of a stone circle would have been made of layers of trellises. Spindles would have then held them all together and would act as a bearing. It is these spindles that would have marked the stones, drilling back and forth and dragging up and down into the stone over a long period of time. The main function of these trellis system therefore, would have been to hold a series of nets in place. The trellis would enable these nets to be raised or lowered or held solid in the wind, depending on the need. It would have been the action of all the spindles and each pole within the trellis being pulled at the same time that would make the trap strong, like a fisherman's net. As animals run into the net and fight against the trap it causes the trellis to bounce back and forth and to and fro. As this happens, the wood of the trap wears against the stone over many years of continual use and subsequently polishes the stone over a great period of time. The stone becomes sculpted as new wood is constantly replaced. I believe that other stones may then have been added in line with the rough direction of the trap opening and closing to increase the spring effect. I have been able to show the patterning on standing stones more recently by using a mirror to split the pictures of stones in half. By finding the rough centre of the stone with the mirror and reflecting half the image back on itself I am able to illustrate how the energy of a standing stone moves from within out. Please view the gallery to see examples of these images and the startling pictures they create. Overall, it is my belief that stone circles were the central hub of community living and over time became market places with dwellings and more elaborate structures. It kept domesticated animals in and kept wild animals out, it created protection and safety for its members as it offered a simple means of communication in its vibration. The movement of the trellis or net would indicate clear information to its members, for example it would alert people to any dangers of the net collapsing and animals breaking out or wild animals getting in. What has inspired me on this journey is to not accept blindly what I have been told but to look with my own eyes and allow the stones and the land to speak to me. It is the evidence that has been left behind that archaeology can only ever be based upon. To support my theory I placed a trellis that I made on sand and pulled it open and closed. As you can see from the photographs below, it left markings behind which when split with a mirror as shown, you are able to create the image of the rams head which appear time and again on the standing stones I have photographed on the gallery page.